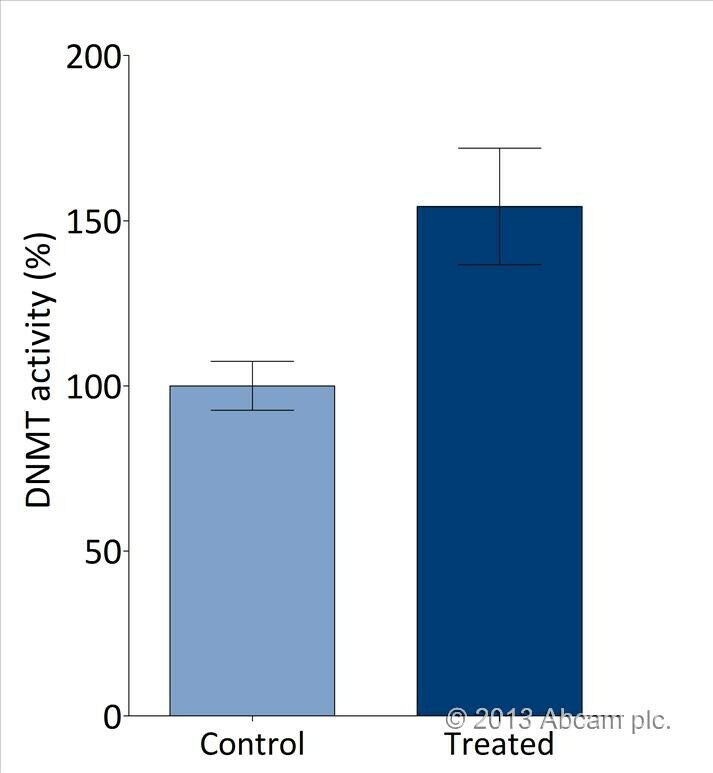 DNMT Activity Quantification Kit (Colorimetric) ab113467 allows the user to colorimetrically measure DNA methyltransferase activity or inhibition at extremely fast speed on a 96-strip well microplate. The kit is ready-to-use and provides all the essential components needed to carry out a successful DNMT activity/inhibition experiment without the need for radioactivity or any special equipment. In the DNMT assay protocol, DNMT enzymes in a sample transfer methyl groups from Adomet to a DNMT DNA substrate coated onto microplate wells. The methylated DNA is bound with a 5-methylcytosine antibody. A secondary antibody binds the 5-methylcytosine antibody, and the enzyme-conjugated secondary antibody is detected using a chromogenic enzyme substrate. DNMT (DNA methylases) is a family of enzymes responsible for the addition of methyl groups on the cytosine ring at the 5' position of a CpG dinucleotide. The DNMT family is required for the establishment and maintenance of DNA methylation patterns. Demonstration of high sensitivity and specificity of the DNMT activity/inhibition assay achieved by using recombinant DNMT1 with ab113467. Demonstration of high sensitivity and specificity of the DNMT activity assay achieved by using nuclear extracts with ab113467. Nuclear extracts were prepared from MCF-7 cells using ab113474. Publishing research using ab113467? Please let us know so that we can cite the reference in this datasheet. Unfortunately RNA is not a suitable sample type for this kit. •	EDM1, EDM2, EDM3 were prepared following manual instructions. •	For blank and positive control wells, the volume was changed to 100 L/well. •	The strip-well microplate was covered with the adhesive film and was incubated in an oven at 37ºC with continued shaking during 3 hours. •	The washes were done following the instructions in all steps. 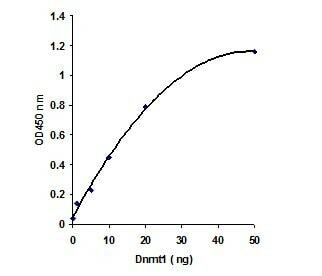 •	EDM5 were prepared in a dilution rate of 1:500 and incubated in the same conditions that in the previous step (oven at 37ºC with continued shaking during 1 hour). •	EDM6 were prepared in a dilution rate of 1:1000 and incubated in the same conditions that in the previous step (oven at 37ºC with continued shaking during 30minutes). •	EDM7 were prepared in a dilution rate of 1:2000 and incubated in the same conditions that in the previous step (oven at 37ºC with continued shaking during 30minutes). •	100 L/well of EDM8 were added and the microplate was incubating at room temperature away from direct light about 30 minutes. •	EDM9 were added to stop the enzyme reaction. •	Activity calculation was done following the instructions. The kit is easy to use and contains all components needed to perform the colorimetric ELISA. Mouse brain samples were used with this kit. Nuclear extract was prepared (with a non abcam kit) from the previous collected mouse brain samples. 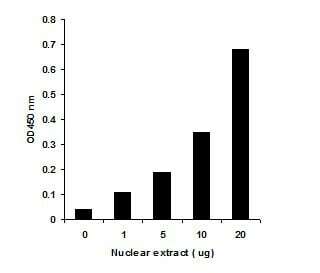 From each sample 15 µg of nuclear extract was used to perform the ELISA. From here on the abcam protocol was followed. The blank an positive controls were included, and the positive control had the highest signal in my study design. Between different individual animals there was a low variation, speaking for the high sensivity and reproducibility of the kit. We have order your Episeeker DNMT activity quantification kit ab 113467 the 21th November with the number K31779. It arrived this morning. The kit is from the lot GR60607-6. I wanted to test it immediately but the vial EDM5 was completely empty also after spin down. I was really sad because i need quickly results. Do you think it's possible to send me a new complete EDM5 for permit me to test finally your kit? I am sorry that the vial you received with this kit did not contain the full amount of the product and I apologize for the inconvenience. I have issued a free of charge replacement vial with the order number of #####. The component number is ab153695. Please do not hesitate to contact us if you need anything further. Thank you for your information! That's very helpful. As I mentioned to you, I am interested in doing some ELISA with your kit but my own coated plate. I have experience in coating plate with proteins (such as different Ig isotypes) but had never coated DNA before, is there any difference between these two procedures? 1 - Is the microplate flat bottom or round? 2 - What coating is used for the microplate? 3 - Lenght of the DNA strands used to coat the plate? 1 - Is the microplate flat bottom or round? It is the flat bottom. 2 - What coating is used for the microplate? Wells are coated with double stranded DNA containing >25% CpGs. 3 - Length of the DNA strands used to coat the plate? The length of the DNA is >300 bps. If there is anything else I can help you with just let me know. I just e-mailed a question about this kit (Cat. Ab113467), but I have another now! The Overview section talks about “a universal DNMT substrate is stably coated onto microplate wells”. I was wondering what this universal DNMT substrate is? I am assuming some sort of unmethylated DNA, but I was wondering if it’s unmethylated human genomic DNA? How long is the sequence? We are looking at a non-DNMT protein and want to determine whether it has methyltransferase activity. It may require a slightly different sequence than the DNMTs require for methylation, so I was just wondering how much variation there is in the sequence? Thanks! Thank you for contacting Abcam and you rpatience whilst I contacted the lab about your enquiry. The Dnmt substrate is a synthesized double stranded DNA polynucleotide ( >300 bps)containing >25%CpGs. We are interested in purchasing your Episeeker DNMT Quantification kit (Cat. Ab113467). Could you send me a few journal article references that used this kit? Thanks! All of the information that we have about this kit is available on the webpage’s for the product. Currently there are no know references for this kit, but we are happy to assure you that it is covered under our Abpromise to work as stated on the datasheets, and if it does not then we are happy to repalce or refund the cost of the kit.